Heat the frying pan in low flame. Pour oil. Add chopped onion and fry it till golden brown. Add turmeric powder, chili powder and coriander powder. Stir well and add mashed potatoes. Sprinkle salt over it and stir well. Shallow fry for 2-3 minutes. Slice the top part of Capsicum and remove the seeds. Stuff with potato filler and layered it in a microwave tray. Pour 1-2 tsp oil over it. Garnish this with coriander leaves. Preheat your microwave in 750w and kept this tray for 15-16 minutes. Cut brinjal into 4 and keep the slit on. Stuff with potato filler and layered it in a microwave tray. Pour 1-2 tsp oil over it. Garnish this with coriander leaves. Preheat your microwave in 750w and kept this tray for 15-16 minutes. Ooooooo!! 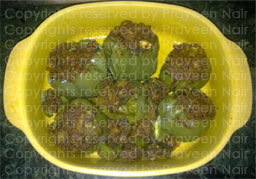 Your lovely stuffed brinjal/shimla mirch is ready… Hot serve with roti or use it as a second dish while having rice.